I’ve found in many of the hotels on this trip that it is hard to find out what they supply and what they don’t. They keep their lights under bushels as it were and this is especially true when they offer something for free. This one The Villa Aria is no exception . In the room there is a huge book which merely contains the menu from the restaurant and a smaller booklet with information on the hotel that seems more like a rule book with things like no noise on the balcony, no swimsuits on the balcony rail, no diving in the pool and so on . All of course are totally ignored by our group of 10 Russians who we are begining to think might be here for the rest of their lives. Luckily I was chatting to a German yesterday who told me about the market down the road. Quite co-incidentely given that I had posted on Here in Puglia about knife sharpeners, he had been to market to buy some knives. He used to buy them in Thailand he told me but now buys them here as they are cheaper and better. An odd souvenir to take home but there we are. How did you get there I asked. Oh he said the hotel has about 10 bicycles that are free for guests they just don’t tell anyone unless they ask them. So I am now the proud owner of a bike and it has allowed me to head off exploring around the area ( Geraldine doesn’t do biking ). This morning I went to the market that the German had told me about. 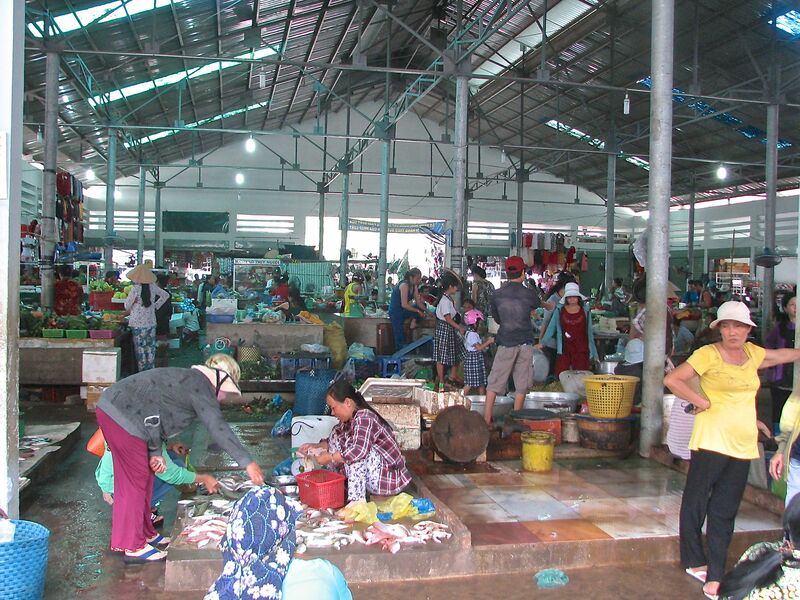 As markets go it is very small and quite well organised. It is quite noticeable how over the last 20 years most westerners have become used to supermarkets and their cleanliness and the way they display food . The young Brits who were here a couple of days ago were telling us graphically about the market and the fact that stuff was displayed on the floor and that the butchers area was so unhygienic with slabs of meat covered in flies being cut up with blood everywhere etc. . It’s not that long ago that even in the Mediterranean they would have been shopping everyday in a market just like the one here for each meal. I remember in Porto, Portugal in 1983 asking for minced goat ( no lamb then) and the guy hacking off part of the goat and then painstakingly chopping it on a trunk stump of wood into ever smaller pieces until it finally kind of resembled minced meat and in that butcher’s shop getting a pigs liver was almost like having to sit in on an operation in the local O.R or theatre at an hospital. 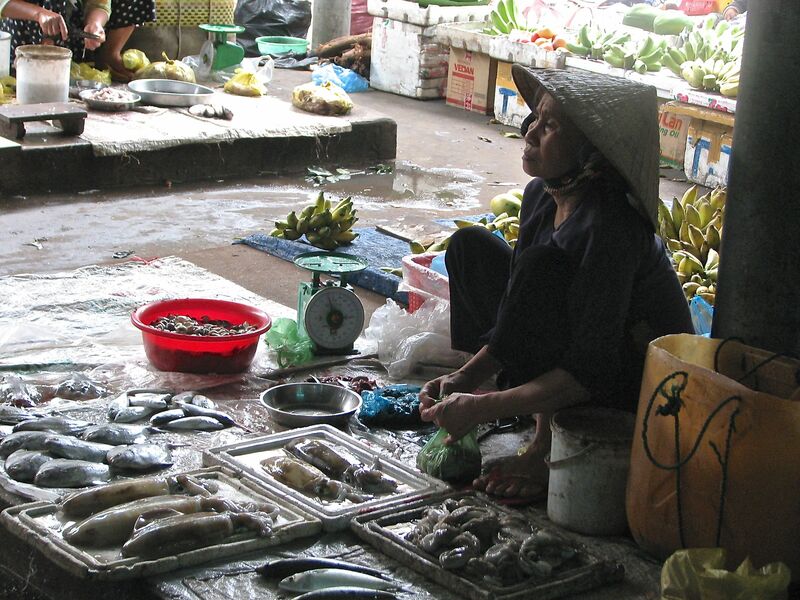 I wasn’t in need of squid but did find some bananas and bought just over a kilo for about 50p. There was a great deal of hilarity when the old lady held up fingers to signify the price which was obviously way over the odds, with howls of derision and disbelief that she could be so brazen. But of course when I stumped up the cash she had the last laugh on them all. The bike has widened my ability to check out restaurants and bars and now each night we take a taxi to a new place and try the food before finding a taxi to bring us home. Last night we actually got pho that tasted like something more than stock cube hot water though if the Brits had found the market distressing I’m not sure what they would have made of the kitchen in this joint. You know they always say that Asians cannot tell the difference between us foreigners that we all look alike. Well last night I asked the cab driver who took us to the restaurant to come back at 10 p.m. to pick us up. After a lengthy bout of sign language with lots of pointing by both of us at my watch and the number 10 he agreed. At 10 we were patiently waiting for him . A cab drew up and we piled in. I was effusive in my thanks to him as he started off for being so punctual and getting back to us. For sometime we drove with him looking at me and me again nodding and saying how well he had done. Suddenly he stopped and in broken english asked where we were going. It wasn’t the same guy at all ! Well they all look the same to us don’t they. 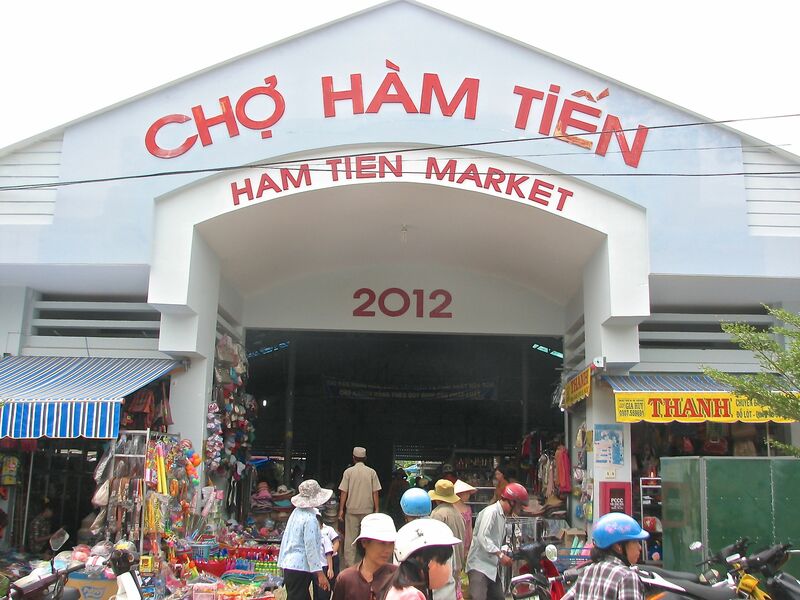 This entry was posted in Mui Ne, Mui Ne Accomodation, Over 60's Gap year, Pho in Vietnam, South East Asia Travel, Travel in Vietnam, Vietnam, Vietnam Food and tagged Cycling Mui Ne, Eating in Mui Ne, Mui Ne, Mui Ne Drinking, Mui Ne Market, Taxi Mui Ne by hereinpuglia. Bookmark the permalink.